Arjo Atayde dedicated his Teleserye Supporting Actor of the Year award to FPJ's Ang Probinsyano lead star Coco Martin. Arjo received this trophy last night, August 21, at The PEP List Year 3 awards night. 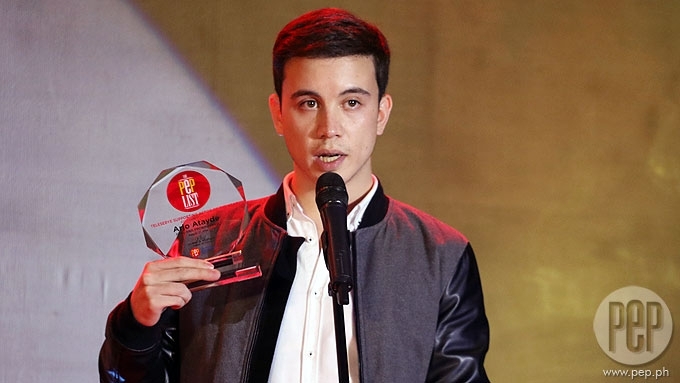 Arjo Atayde became a bit emotional when he accepted his Teleserye Supporting Actor of the Year trophy at The PEP List Year 3 awards night yesterday, August 21, at Crowne Plaza in Ortigas City. He won the said award for his effective portrayal as the villain cop Joaquin Tuazon in Ang Probinsyano. During his acceptance speech, Arjo thanked his family, Star Magic, ABS-CBN, and Dreamscape Entertainment, the unit producing his current TV series. Arjo even said, "All I wanna do when I entered this industry is just go on-screen, act, grow old in my life." Towards the end of his speech, he also expressed his gratitude for Coco Martin, the lead star of FPJ's Ang Probinsyano. "Before I end this speech of mine, there's one last person I wanna thank. "I don't mean to brag, but three years ago, he called me, it was in Star Magic Ball. "He was being escorted by marshals, and the marshal didn't know who I was, of course, I was really new. Arjo then revealed how he got the role in the Kapamilya primetime series. "Three years after, I was supposed to be in three different teleseryes. One, I was pulled out, two it didn't work out, three, I was pulled out. "And then I was wondering why I was pulled out, did I gain weight, did I have a problem with anything like physically, attitude ba? I don't think I have." It can be recalled that Arjo was supposed to play the role of Jigs in On The Wings of Love. The role eventually went to Albie Casino who co-starred with James Reid and Nadine Lustre. During The PEP List, OTWOL also won Primetime Series of the Year. "Three years later, I opened the door and they just told me there was a storycon. "I opened the door and then Coco Martin goes to me, hugs me, and tells me 'This is what I promised you.' I dedicate this award to him." SYLVIA AND RIA'S MESSAGES. Meanwhile, Arjo's mom and The Greatest Love lead actress Sylvia Sanchez also expressed her happiness that her son received an acting award. In her Instagram, she shared a photo and provided the caption: "Yahoooo! 2016 teleserye best supporting actor #fpjangprobinsyano #peplistyear3. "Thank you, ABS-CBN. Thank you, Dreamscape family and thank You, GOD!! Congratulations!! Way to go anak @arjoatayde #proudmom #happiness #priceless #myeverything #blessed." Yahoooo! 2016 teleserye best supporting actor #fpjangprobinsiyano #peplistyear3 thank u abscbn, thank u dreamscapefamily and thank u GOD!! Congratulations!! way to go anak @arjoatayde #proudmom #happiness #priceless #myeverything #blessed Yahooooooo???????????? Arjo's younger sister Ria also gave him a sweet message on Instagram. She said in her caption: "My brother @arjoatayde has never failed to fill me with love and joy. "Congratulations on being awarded as #PepListYear3's Teleserye Supporting Actor, Brodie. "Know that through every success and every trial, I am here with you 100%. You deserve everything and more and I can only wish to achieve half of what you have in your stay in showbiz. "You make me proud. Let's celebrate when I get back. I love you (ew)!" My brother @arjoatayde has never failed to fill me with love and joy. Congratulations on being awarded as #PepListYear3's Teleserye Supporting Actor, Brodie ???? know that through every success and every trial, I am here with you 100% ?? You deserve everything and more and I can only wish to achieve half of what you have in your stay in showbiz. You make me proud. Let's celebrate when I get back. I love you (ew)! Coco and Arjo's series FPJ's Ang Probinsyano is set to celebrate its first year on the air this September.